Debt-Free and Queer ft David Auten and John Schnieder - Oh My Dollar! A Genuinely Messed Up Situatio..
Open Enrollment is like playin..
Are you ready for a cute, heartwarming, and thought-provoking interview this week? I hope so, because after a month of American health care on this show, I’m ready for an uplifting story. 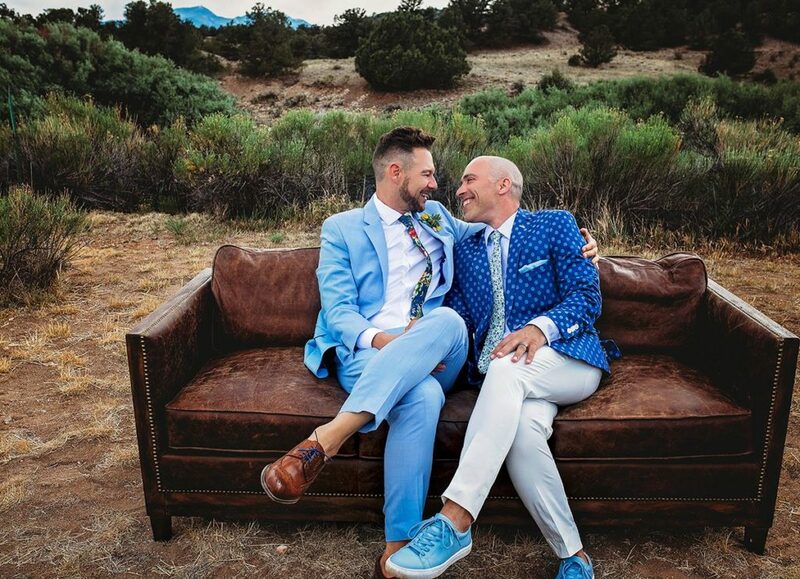 John Schneider and David Auten of DebtFreeGuys.com and Queer Money™ podcast help queer people live fabulously, not fabulously broke. David and John join for an interview talking about their own money stories, how they paid off $60,000 of credit card debt in 2.5 years, how to find non-homophobic companies to invest in, and why they think financial literacy is important in the straight community. OMG how freaking adorable are those two? The HRC (Human Rights Campaign) Corporate Equality Index – evaluates publicly-traded companies based on metrics for their GLBTQ+ friendliness at a corporate level. : Welcome to Oh My Dollar! Money can be scary and stressful. Here we give practical, friendly advice about money that helps you tackle the financial overwhelm. I’m your producer, Will and here’s your host Lillian Karabaic. : So I’m super excited about today’s guests. There are just delights in in real life and hopefully you’ll get this over the air. But yeah David and John I’m so excited to have you on. : Thank you so much for having us. : Definitely we’re excited to be here. And being too kind. and I was on your show a couple months ago and then we met in person at FinCon which is a financial blogger nerd conference in Florida which was being Florida in its weather ish. So yeah, but y’all are based in Colorado right? : Correct. We are in Denver. That’s where we record the Queer Money Podact, where we are currently right now in the closet no office space. : We record in our walk-in closet. : The irony of being in the closet to come out of the closet on-air. All right. Well I would love to hear a little bit about your personal stories. How did you end up caring about finance. How did you end up doing – you – I mean this is a large part of your life now. So how did you end up talking about finance? How did you get into this? : Our whole life now. Yeah. : So if we go all the way back I really didn’t care that much about finance. What I cared about was making a paycheck. So my very first job my whole first full time job was at a mutual fund company. So this is David., and that kind of got me interested in the idea of money and how it affects our lives. It was later, after John and I got together, that we actually started going down the personal finance route – but all during that time period afterwards, until I quit my job this past April, I have always worked for financial services companies. : And were you a nerd about it in your own personal life when you first started working in financial services or was it just kind of a job to you? : It was a kind of a job, although I will say back in the day when the internet first came or came to life, I used to go online and check stock prices which I guess that makes me a little bit of a money nerd. But it didn’t have a major impact on how I lived my life and how I spent my money until after John and I got together. : And what changed when you got together? : *Laughs* Our aha moment when we realized? : David finally achieved happiness, and then he realized that his finances were all messed up. : I think what happened is we had our aha! moment when we confessed to each other that we had fifty one thousand dollars in credit card debt. : That is a lot of debt. : And one thing to keep in mind is that was 15 years – well, 12 years ago. : So that probably is more like 60 – 70 thousand dollars in credit card debt today. : So did you build that up kind of gradually and then all of a sudden realize at that 51,000 number that like “Oh! This is a moment” Was there anything that kind of happened to you to make you go “oh my gosh!” Was there- Was there a snap moment? : Yeah. So this is John. So I would say that David snap moment was asking me to be his boyfriend, because that’s when he all of a sudden acquired an additional 30,000 dollars worth of credit card debt. : I brought most of the debt to the table. : And it wasn’t an oh snap! Words we can’t say on the air! : So yeah this is John. I brought thirty thousand dollars of debt to the table but neither of us really – none of it was because of an emergency or because of a health scare. It was all simply just due to unconscious spending, and not necessarily understanding how credit cards work. Most of my purchases were slightly bigger ticket items. I was a fashion queen. I needed to have new clothing every weekend when I went out. So I had stupidly expensive jeans, and t-shirts and more shoes than Imelda Marcos. : But then David, was more of a nickel and dimer. He accumulated to his credit card debt mostly from stopping at, quite honestly the coffee shop and the bagel shop too too often, going to Chipotle, maybe a little bit too much. His role slightly smaller, so he would always look at me with judgment and disdain when I came home with these like huge bags of clothing, because I spent so much money. But then he would always nickel and dime himself, and when he realized in the long run he probably spent more in interest payments than I did, because I paid my debt off more quickly than he did. He was a little bit jealous. : So did you when you when you kind of realized this did you end up you were you already together. Did you combine forces for the debt payoff? Did one of your incomes contribute more than the other or was it were you just sort of encouraging each other? : I think what was really important was we had been together for a year and a half and our aha moment was because we were thinking about making a really foolish decision. We were thinking about buying real estate so we could build a vacation home. The stupid decision part about it was that at the time we were living in a basement apartment. We didn’t even own a home. So we had no reason to have a vacation home. What happened is we left us this cute little ski town in Colorado and drove home and it was on that car ride that we started talking about our financial state. : It was that kind of what do we want out of life was the first decision that we made and because we’d been together for a year and a half. I think at that point we said to each other. This is a partnership, we have to do this together. We have to support each other in our goals. And we came up with what was important for us in life. : And at that point, we realized we need to change our spending if we want to get that. And as John mentioned, he paid his debt off faster than me. We did combined forces to a degree, and that was primarily for covering our living expenses. But then we each tried to cover or pay off our own debt. And John at the time was making a little bit more money than me. So he had more money to put towards his credit card debt. And as John mentioned I whipped up a little bit more often than he did because I kept up with some of my small spending, which I put on my credit card. So it did take me a little bit longer. : I can – I can tell you two have talked about this before. : So I’m learning all about this for the first time myself. : So did you feel like – was the drive to become debt free? Was it a moment of – was it was it driven primarily by financial goals – or was it – but was it because you were like “hey I would like us to be in the position of being able to buy a house or buy a vacation home at some point in the future and we can’t do that.” Or was it more about kind of the feeling of being debt free and the options that it was going to open for you? : Yes. So I think this was John for us. We just kind of had that aha moment and we’re like we’re not happy with where our lives are. I was also in financial services. I spent 12 years working for a Fortune 500 company. And here we were helping other people with their money but we weren’t helping ourselves. And we knew that we were making a decent amount of money that we should have had a much better quality of life than we did – at that time that we were renting a basement apartment. We had a lot of friends, mostly straight friends who were getting married and building houses and having children. And at that time that’s just – not only was marriage equality not available to us but we just couldn’t have afforded those things in our life at that time and it made no sense because our peers could, then a lot of our peers a lot of our friends are in the industry. So we kind of knew about what they were making as well. And it was just the realization that if we continue to do what we’re doing, we’re not going to have the best quality of life that we know that we’re capable of having. : And it was when like David said when we realized the fancy jeans and the happy hours and all that while they were great and we enjoyed it they weren’t really providing – fueling our soul. : And we realized that what what we most wanted in life was to number one travel extensively but not do it on credit anymore, to save for a comfortable retirement and to give back to our community. And at the time we couldn’t write a ten dollar check to any cause without actually penalizing us in the long run. So there’s no point in helping other people if you’re just going to make hurt yourself even more. : So we thought we got to flip this around and we knew enough from working in the industry that we could turn our situation around and if we buckled down pretty hard we could do it pretty quickly. So that’s what we did and we paid out paid off our debt in two and a half years. : That’s awesome. So and you’ve kind of transferred transferred one of the ways that you’re giving back now is that you you have your show, the queer money podcast, and you’re doing a lot of work on particularly queer – queer finances and letting people kind of look into the fact that you know trying, trying to fuel their lifestyle with debt isn’t necessarily going to make them the happiest in the long term. So do you do you – Was that driven by your kind of feeling that queer folks are less likely to have access to financial information or resources than straight folks? Was there a reason that you particularly wonder focus on the queer community? : Sure. So this is John again – towards the end of David not paying off our debt, we started to write a book and when we had a rough manuscript written, we shopped around to different agents we got a lot of positive feedback on it but nobody would take us on. And someone reached out to us, and said well no one’s going to take you one as a client because you don’t really have a platform. You don’t have a radio show, you don’t have a blog. Nobody’s following you. We thought that that having the book was the platform but we were confused. And so we – we use that information we kind of dabbled into blogging for a little bit and we realized that we liked it. We had a lot to offer, but we’re speaking at the time to everybody. And when we went to our first FinCon conference, which was in 2015 in Charlotte, we realized that at the time there are about 900 to a thousand people there doing similar stuff to what we were doing. And we notice that there were military spouses and mommy bloggers and also sort of niches – all different blogs trying to target a different community, but nobody was targeting the LGBTQ community. : And one woman even said to us she said “Why are you trying to be Dave Ramsey?” She said “He’s got that market captured.” You need to niche down and speak to your community. And we thought about that long and hard and we said after we came home from that particular FinCon conference that nobody was speaking to our community and we’re a gay couple. And we know the personal struggles that we have both financially as long as you know coming out of the closet, and trying to overcome bigotry and all that. And we thought maybe we could speak to our community, and we realized that there were a lot of in our community that need that need help. So not only could we give back once we got out of debt, we donate our time and our money to our community, but we could also provide the education both from our personal and professional experience to help our community with its finances. : I think this is so important. And as we talked on your show a little bit about how a lot of the community work I do is financial literacy with queer homeless and transitional youth. And I – I find that the financial literacy when you’re caught up in just trying to navigate the world in you know a hostile world and especially folks when right at the age where financial literacy is so important. Often, often the youth that I work with are dealing with the fact that they you know their family of origin has has disowned them or or other situations that they’re dealing with. And financial literacy is just very low down on their list compared to perhaps their straight counterparts. Do you think there’s like financial mistakes or traps that GLBTQ take you folks are more likely to fall for than kind of their hetero-normative peers? : I don’t necessarily think that it’s significantly different. I think when it comes to your finances about we think about 80 percent of what we deal with financially is the same whether you’re queer or not. There are some unique considerations for our community but I think one of the things that we really see happening in our community is that we fall prey to a similar way of thinking. John and I especially this was the big problem for us is that we felt that we needed to impress our friends and we needed to stand out, you know as as growing up as gay men especially in households where that was absolutely not approved. We had this kind of self-doubt or negativity or self-loathing inside of ourselves. So as queer people, we oftentimes try to excel at something and one of the easiest ways to excel in this world is to make people think that you’re fabulous – whether that’s fabulous because you drive a great car and you live in a beautiful house, or that you have the most pets and you eat all of the right organic food. It’s it’s – it’s not. : Right. We can easily fall prey to wanting to impress other people at the cost of our financial security, you know and John and I – that was our one of our biggest problems is we felt like we needed to do this. We were trying to fill other people’s desire to be around us with fill it with our desire to make ourselves feel whole and that’s not the right way to do that that. : So one one thing that I hear a lot from the youth I work with is that they are just generally distrustful of financial institutions and the like- And one of the reasons that they are is that they’re like oh I don’t want my money to go to supporting homophobic causes, right? So like a lot of the big banks and big investment firms donate money to political candidates that might be like literally trying to destroy me as far as I can tell. So like how do you how do you do research in trying to find someone, trying to find a financial institution that you feel like as a partner and supports the community and isn’t homophobic. : How do you do your research? : I think one of the first things is if we need to understand is that these institutions are. They’re businesses that are trying to make money so they’re going to do what’s necessary to keep them going in business. So sometimes we may find that there are institutions that are somewhat speaking out of out of both sides of their mouth, because they need to appease multiple demographics. Right. There isn’t a LGBT brokerage firm or an LGBT bank. Those things don’t exist. So there isn’t one that is 100 percent focused on our needs and the desires of our community. But there are ways for us to see what it is that those firms are doing to help them support our community. And typically what you’ll find is that there are some research tools you can use. There’s the HRC index where a lot of financial firms are receiving one hundreds, although John and I like actually to go a little bit deeper. There’s a an exchange traded fund called EQLT. They do research much differently than the way HRC does it. They actually ask the employees whether or not that company is doing a good job at enforcing or appreciating the unique needs of the LGBT community. : So these companies these financial services companies, that are a part of that index actually take it to a higher level than the ones that are a part of the HRC index. And I will say John and I used to work for a firm that consistently would get a one hundred. And while we worked at that firm, we begged them to provide collateral or material that showed LGBT couples or that had some sort of slant that it would make it easier for an advisor to work with someone who was queer, and the company consistently told us again and again no they would not do that. So you may be getting a 100, but are you actually doing the work? That’s our question. : I think it definitely I think other things that you can do too, is there are more and more financial services firms who are starting to include LGBT people in their collateral and their marketing. You can easily find that by googling or going on to YouTube and then there’s also more companies who are trying to understand our community more and they provide an immense amount of resources for David and me to help with our cause, and that they’re doing a lot of studies and surveys of the LGBT community as it relates to finance. And you can find that on Google as well so if you see companies that are kind to trying to engender our community in those ways, those would be the companies I’d maybe lean towards. : That’s really cool. Those are some great resources for folks. So is there anything else as as as we wrap here, is there anything else that you want to impart upon our listeners about money? : I think one of the most important things about money is to remember that for our community it is more so than the straight community, it’s a tool that we can use for good. We, as a community, that we know especially our transgender brothers and sisters, with what’s going on with the federal government right now are faced with issues that can impact us to the very core of who we are, and if we are struggling financially because we’re making not the best decisions, because we want to go to brunch on Sunday or because we need the right pair of jeans or to shop at the right, right stores have the right kind of dog. If we’re sacrificing our financial strength, that is also sacrificing our community. Well John and I absolutely believe that being strong financially is one of the most important pillars of who we are as a community, because when we give back to our community – we’re actually making our communities stronger not just financially, but fighting for our rights. And most of our straight peers they don’t have to do that. : All right. You somehow have some more energy when you’re not constantly just fighting to prove you exist. : And the same thing goes for financially – if we’re struggling financially we’re distracted by that, and then we can’t give our all to supporting whether it’s boots on the ground, or it’s campaigning for a particular politician, those kinds of things will suffer because we’re worried about our finances. : I have so much more energy when I’m not worried about money. : Like to be a huge drain. : I was just I was tired all the time when I was broke greatly. It’s it’s just the fatigue that sets in. And some of that is like related to working multiple jobs but a lot of it just has to do with that constant background noise that kind of contributes to being unsure about money and never – never being quite sure. And it just feels, like you don’t have the same kind of resources to put towards the stuff you really care about. : Exactly you’ve got that cut like sort of unconscious stress constantly on you and when you can take that off of yourself and you have so much more energy and clarity to put towards more important things. And Dave and I – I know that our community tends to be a little bit averse to capitalism and to big corporations and even to money in some regards, but money can be a really good source for good. As David said so I think we need to start changing our paradigm of how we look at money and how it can actually be used to help us if we’re constantly thinking it’s negative and bad, it’s going to be hard for us to be able to attract money and then be able to give back to the important causes that can help our community out. : I think that is an excellent note to end on something, I asked every guest would you can either answer jointly or you can answer by yourselves, but what are your best personal finance decision and what was your worst? : Well I think jointly we’ll probably have the same answer. This is John again, after Dave and I paid off our debt we accumulated some money, we decided that it was time for us to buy a house or a condo just before the market crash in 2008. And, but fortunately, we realized that having a big house having a fancy house, was not important to us and while our friends at the time were buying two and three and 4000 square foot houses. That was of no interest to us. And we because 1) we do want to take care of it 2) it wasn’t important to us. And 3) we knew it would detract from the things that were important to us such as giving back to our community and travel. So despite our real estate agents constant pressuring, we bought a condo that was only one and a half times our household income at the time. : For those who are familiar with the general recommendation is to try to stick between around three times your household income more commonly now people go up to five and six times. So we didn’t want to be house poor and only because we bought a house that was so cheap relative to our household income, could we survive the crash of 2008 and still travel quite extensively. A month in New Zealand and Australia several weeks in Mexico and other countries. And yeah it was great, and only because of that had we been able to grow our business and then both quit our jobs. : Oh that’s I’m so I’m so glad to hear that and I’m also jealous of real estate prices or your household incom, I’m not sure which. : We did sell that condo this year because it no longer fits into our our future goals. You did ask about our worst financial decision yet though. : So I think that probably one of my worst was the fact that for 17 years, I allowed credit cards to be the means in which I live my life – everything that I bought went on a credit card and it became this albatross around my neck that it took forever to get off. And that was something that was. Whether it was two dollars or two thousand dollars, I was predominantly putting it on my credit card and not paying it off so that there wasn’t any benefit to getting the points that I was getting or the rewards those getting because I was spending way more money in interest fees than any sort of reward I could have ever gotten from those credit cards. : Yeah all right. I mean I think credit cards and buying smaller houses is a pretty excellent advice for our listeners. So if people want to find more of your stuff – I love your show, it’s kind of like hanging out with like very cool friends talking about money. : Someone thinks we’re cool. I like it. At least one person. : And it comes to you live from a closet in Colorado. So if people want to find you where do they go? : Yeah. So we’re pretty much debt free guys everywhere. That’s our website. That’s instagram, twitter, facebook then that our podcast is called Queer Money which you can easily find by googling that or the URL is queer.money and we publish new episodes every Tuesday via iTunes, Soundcloud and all that. : That’s awesome. We will definitely link to those in the show notes and yeah. Thank you so much for joining us. It’s been a delight, and hopefully I will you know see you in person again at some point. : Oh totally. Thank you so much for having us. We appreciate it. : I think that wraps our show for today will our producer is Will Romey and our intro music is by Aaron Parecki. I’m Lillian Karabaic, your personal finance educator and host. Thank you for listening. Until next time, remember to manage your money so it doesn’t manage you.